Written and directed by Ana Lily Amirpour. With Sheila Vand and Arash Marandi. Opens Friday. A Girl Walks Home Alone at Night — atypical title, exceptional movie. The fact that it is the first Iranian-American vampire film is in itself a surprise, but the debut feature by writer-director Ana Lily Amirpour is more than just an unusually effective horror shocker. In a curiously disorienting setting that might as well be Iran, or anywhere at all — it was shot on location in Bakersfield and Taft, California, in gorgeous black and white — we are introduced to a cluster of characters who only seem to come out at night. Arash (played by Arash Marandi) is a modest young man, a gardener by trade, who shares a house with his ailing father Hossein (Marshall Manesh), a drug addict in debt to a loan shark named Saeed (Dominic Rains). Saeed typifies the pitiless, vain hustler with his piercings, tattoos, bad-taste bachelor flat furnishings, and tough-guy attitude. Hossein can't pay up, so Saeed drives off in Arash's '57 Thunderbird. There's some unfinished business in Bad City. Saeed isn't the only nocturnal predator. A mysterious young woman in a black chador (actress Sheila Vand, in character as The Girl) also cruises the streets, choosing victims and sucking their blood. The Girl enjoys toying with her prey, slowly mimicking their actions when she accosts them on a lonely road, like a fiend from a creaky silent movie. We look in on other characters as well, such as Shaydah the rich woman (Rome Shadanloo), Atti the prostitute (Mozhan Marnó), and a bratty little boy on a skateboard (Milad Eghbali). There's a party with dancing and lounge music. The Girl has plenty of options to slake her thirst. So why then does she vamp on a homeless man? Filmmaker Amirpour imbues the simple story with a European tone of subdued dread reminiscent of Alain Robbe-Grillet (his L'Immortelle particularly) and vampire fan Jim Jarmusch (whose foray into the genre, Only Lovers Left Alive, was released earlier this year). The sound engineering of Girl startles us — you can clearly hear the breeze whistling in the trees and the intake of cigarette smoke as The Girl and Arash warily circle each other. The dialogue, in Farsi with English subtitles, is minimal — that's disconcerting enough. The characters pass by a gully filled with corpses as if it were commonplace. Bad City exists in an Iran of the imagination. We're set adrift in the supernatural Mideast, with a mesmerizing soundtrack of electro-romantic tunes by Federale, Bei Ru, and Kiosk. Amirpour, a native of the UK who now works out of Los Angeles, is supremely talented. 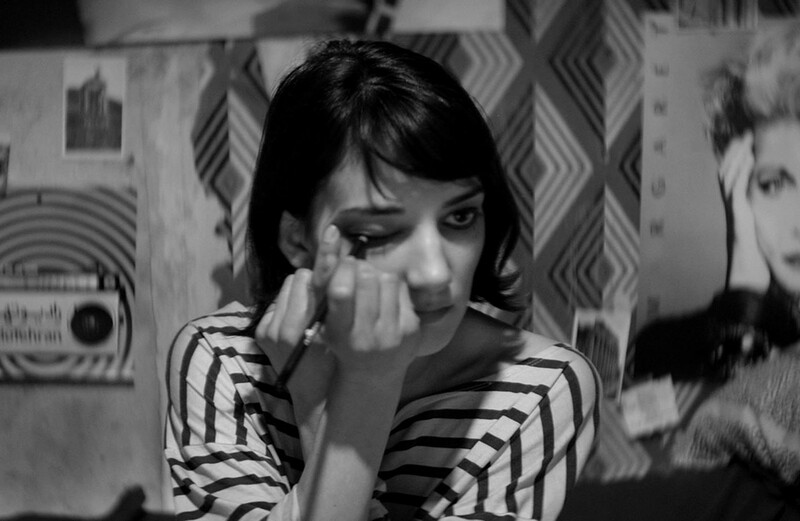 A Girl Walks Home Alone at Night is one of the nicest surprises of the season.